Awhile ago my friend Brok discovered the site www.gog.com Good old Games which sells many classic games in an updated DRM-free format that can run on modern systems. His main objective was to gain a working version of the X-Wing and TIE Fighter collectors editions and we found there was not only those but a whole host of classic Star Wars games of which we purchased quite a few in bulk during the sale inc X-Wing vs. TIE Fighter and the entire Jedi Knight series. 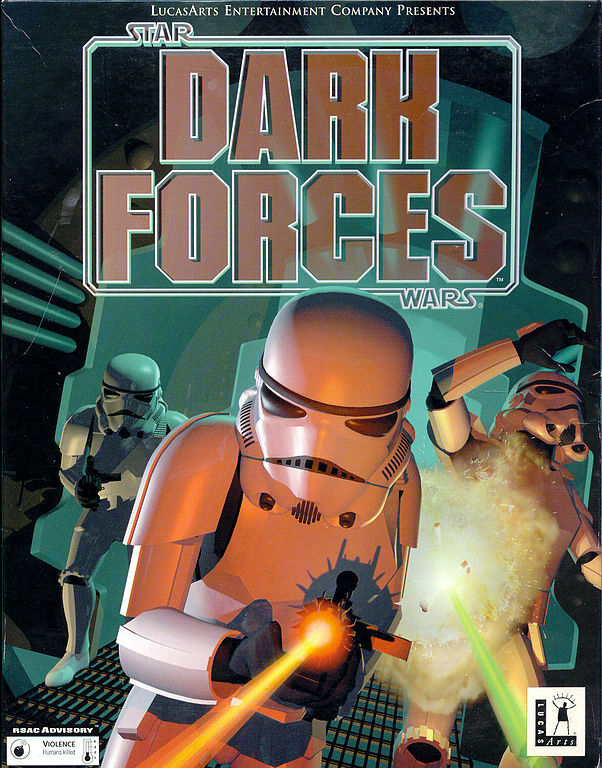 For those of you who don’t know, Star Wars Dark Forces is the first games of the Jedi Knight series of games which also include Dark Forces II, Jedi Outcast and Jedi Academy which you’ll know from a previous review. Once I had purchased them from GOG.com I decided to play them in order starting with Dark Forces. 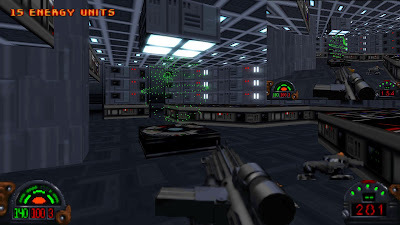 Star Wars Dark forces was released in 1995 the time where the “3D” First person shooter was king and that king was for the most part the king was the Doom series, indeed being very similar to Doom the game was often compared to Doom but reviewers always indicated that the game had many features that improved upon its competitors. 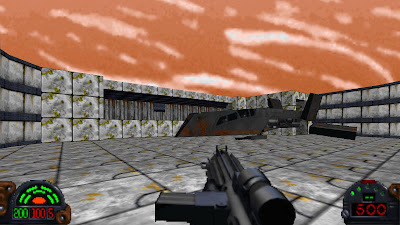 Dark Forces featured the ability to look up and down, duck and jump and featured an additional resource battery power to run various equipment powerups such as the headlamp and night vision goggles. 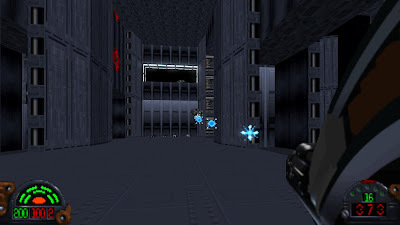 To make these changes the developers had to create a whole new game engine simply titled Jedi, this allowed them to create multi-levelled maps which unlike Doom had rooms directly above or below each other that you could walk around, moving conveyor belts and some objects that were fully 3D such as smaller starships (though these were quite obvious when you saw them). It also had a much more engaging and involved storyline then Doom, adding various puzzles and strategy to the game as well as finding secrets and requiring keycards to advance. Atmospheric effects such as fog and haze and animated textures and shading were also added to great effect. Installing GoG games are fairly easy as the package is just downloaded from the main site then extracted with a built in installer. This is just as well as it uses Dosbox to run and I’ve messed around with that thing before but never got it to work, but fortunately this did and I was able to start playing. There has been many comparisons to GoG and Steam though there’s one major difference that I found was summed up well by Jerry Holkins (Tycho) of Penny Arcade, he says that Steam is more like a jukebox that (supposedly) holds or your games but if it goes offline or has login issues then you can’t play them, whereas GoG is a vending machine that gives you full access to the product after you pay for it. I’m not exactly sure which one I like more, I do like letting steam take control of everything (installation/updates etc) and it’s great when you’re trying to make sure you have the same game version as other people especially with older games like Unreal Tournament 2004, Origin also helped with Battlefield 1942 (as well as Warcraft 3) as I can remember a fair few times where a group of us had problems getting the correct version in order to play together. Though the control setup menu the game provided was easy to use, I found that I just couldn’t quite get the setup I liked, I could use the mouse but it just didn’t feel right as the controls were set up in sections and you didn’t have an options to change the alt fire to a mouse button (though I didn’t use this very much). This was probably due to the fact that I had been the Doom series with ZDoom which if you didn’t know allows you to play any of the original Doom series with much more features including much better graphics, and the ability to jump and use the mouse to look free including up and down. So being used to this of course it was kind of hard to play a whole game stuck in the same view, you did actually have the ability to look up and down though this was used with keys and wasn’t the same as the free mouselook we’re used to today. I did play a few levels in this mode but due to the difficulty and annoyance of not having free look I decided to try to find a similar type of mod to ZDoom I came across DarkXL which is basically exactly what I was looking for and it worked very well as it gave the game much sharper graphics and better controls. Though I soon found that although it worked well for the first few levels there began to be many bugs inc no sound and crashing on certain levels, impossible puzzles and blocked doors, missing cinematics and the inability to use several late-game weapons, I found this out much too late as it was only on the last few levels that I realised that I should have been able to pick up certain weapons and enemies should have dropped certain weapons though this hadn’t affected me as I did just fine with that I had. I did eventually get through the game (and use the weapons for a short time) but only through using various cheats though it was a lesser experience as a lot was missing from the later parts of the game, some of which I had to go back to the Dosbox version to see. I recently found that on the XL Engine site itself the game was actually listed as being in its Alpha stage and 98% towards beta (if I had only waited a bit longer XD) so basically I might go back to it again, either modded or unmodded, but I experienced enough for this review nonetheless. So with that out of the way on to the story. You play as Kyle Katarn who you may already know from the other games in the Jedi Knight series, the developers had actually wanted to use Luke Skywalker but due to gameplay and story constraints they created Kyle Katarn as a completely new character. 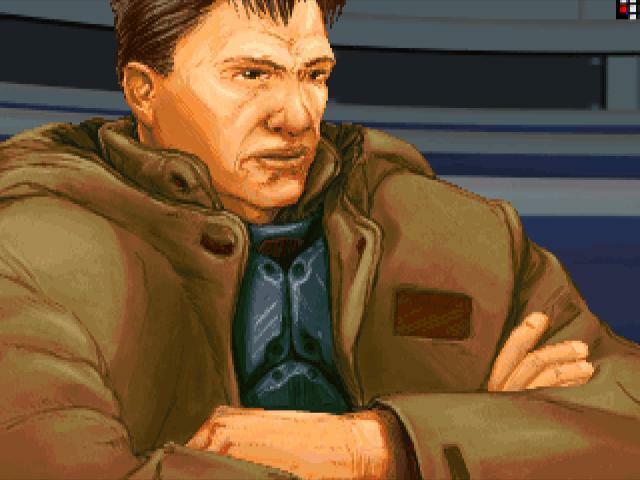 His brief history of having previously defected from the Empire after he found they were responsible for killing his parents (with the help of Jan Ors) and was now working as a mercenary for the Rebel Alliance. The main story involves Kyle investigating the Dark Troopers which had been created by Imperial General Rom Mohc about the massive starship the Arc Hammer, so you basically go from level to level gathering intelligence with some rescues and escapes along the way. Of all the planets visited during the game I only recognised Nar Shaddaa and Coruscant with the rest including Danuta, Anoat, Fest, Cal-Seti and many others which I didn’t recognise. I found the story pretty damn engaging as it kept me going through all of the issues faced with the mod and it was great to hear about all the new star wars lore and the origin of the Jedi Knight series which I hadn’t known since playing Jedi Academy heaps of times. As I mentioned playing the game with the DarkXL mod made it much better (at the start at least) I could move freely with the WASD keys I could look freely with the mouse, I could crouch and jump and touch buttons all good, the graphics were much, much better as you could run the game with your native desktop resolution. Basically the game plays the same way as Doom with you running around shooting enemies and completing objectives though armor is represented by “shield” power, I spent the majority of the time not using cheats as compared to Doom as I found the difficulty not too bad. 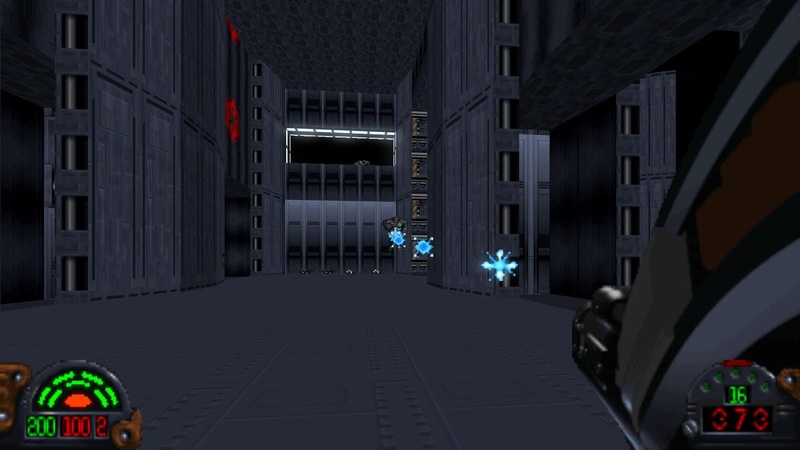 The guns in the game are good and I had fun shooting down piles of Stormtroopers, you start with a generic laser pistol before almost instantly getting hold of the Stormtroooper laser rifle which basically becomes your mainstay weapon throughout the whole game, the thing is that good, the ammo is plentiful (most imperial soldiers drop rounds) and it shoots damn fast. My other weapon of choice was the imperial repeater gun, this thing has even more pewpew and shoots very fast but has weaker shots and takes power cells which are harder to find, and my last weapon of choice was thermal detonators which are plentiful on certain levels, when thrown these detonate on impact (unless using secondary fire) and you are able to throw a ridiculous amount in a short period of time (like 3 a second!) so taking down bosses with these was no problem at all. Other weapons included the Jet fusion cutter which was a powerful but slow firing laser bolt gun, the I.M mines which are basically claymores, the Mortar gun which speaks for itself, the Stouker concussion rifle which is a long range AOE blast that tore apart most standard enemies and the Assault Cannon which is used by Dark Troopers and shoots both Plasma and rockets. The last three I unfortunately didn’t use very much due to them not being implemented in the mod yet and me having to add them in using cheats. 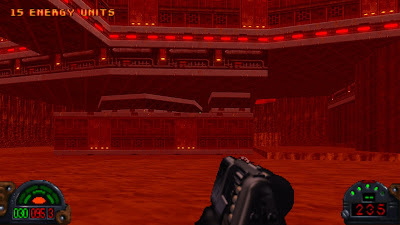 I mostly plowed through the levels as I enjoy the fast pace of these style of games but I did notice the subtle differences from the Doom and Jedi engines that I mentioned before, specifically things like "room-over-room" multi-levelled stages which had much more lift and platforms then Doom and made traversing some levels very confusing when you had rooms right on top of each other, there was also many instances which required you to solve puzzles which included changing switches in a sequence to open doors and moving entire ships to change from one section to the other. 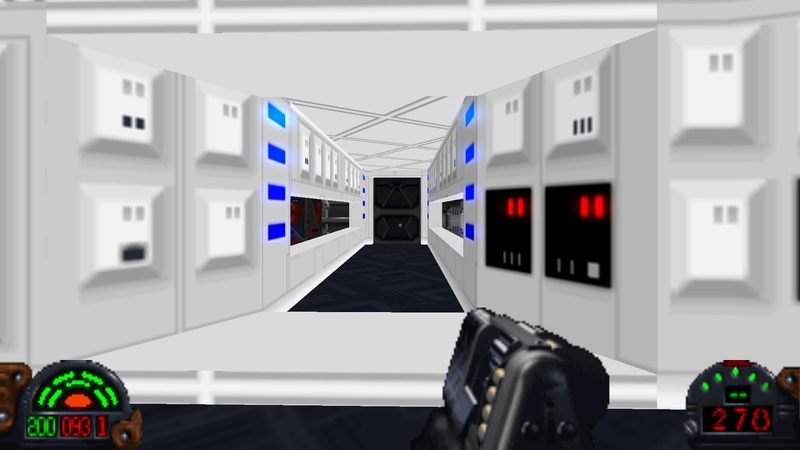 The game had multiple objectives which were part of the storyline so it gave the game much more depth than just randomly killing (and occasionally obtaining keycards) to get to the end of the level. One thing I didn’t like was that you couldn’t save anywhere you wanted like in Doom, you had respawn points but if the game crashed for example you could load a save you just had to start all over again which was a bit annoying. 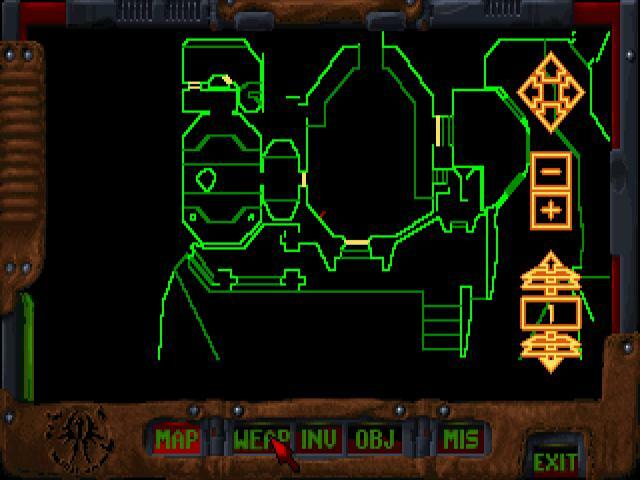 As some places were multi-levelled, the map was had the ability to change which level you were looking at though it was still tricky. 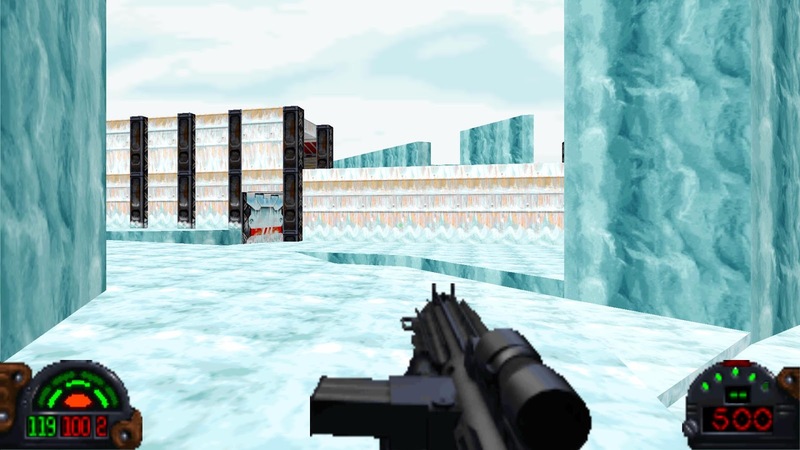 You also had the ability to view your weapons, inventory and objectives which was a great help. I didn’t cheat throughout most of the game (the actual invincibility cheat could not be used with the DarkXL mod) but I topped myself up with health and ammo at times towards the end. In regards to pickups there was you basic health and shield pickups as well as your laser ammo, power cells for those weapons that took them were a bit more sparse the same with mortar shells and rockets, most of the time you were overloaded with the ammo that the enemies in the level dropped. Then there was the other items that used battery pickups such as your headlamp, infra-red goggles and the air mask, the latter of which I could not work out which button it was to use it lol as there was also extra lives and restart points for when you died. Though by far my favourite was the weapons supercharge which triples your rate of fire for a short period of time, heaps of fun to use and together with the rest of the pickups made the whole experience more fun and interactive. As I mentioned before the graphics for the original game were (understandably) quite poor as they only went up to 640x480 but the DarkXL mod you could have your desktop resolution which made it great looking and much sharper, whether you had the mod or not the locations still looked great, there was plenty of areas that I recognised from the movies such as the white interiors of some ships from that first scene in episode 4 and everything had that distinct Star Wars flare. 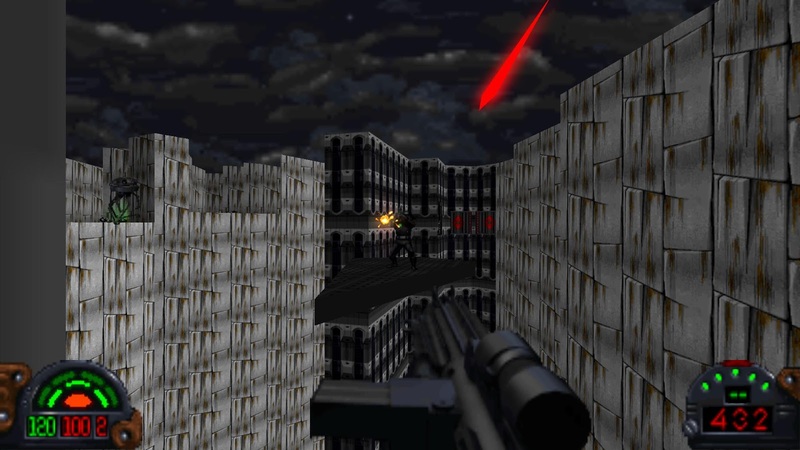 The new engine was able to create gameplay and graphical elements such as fully 3D objects, atmospheric effects such as fog and haze, animated textures and shading which was evident in the levels as there were lots of things moving around such as bridges moving and ships flying around outside and many kinds of moving 3D objects. The textures do lack that flair that Doom had with the all the demonic imagery and gore but as this was a Star Wars game the developers had to stick to the content and the game being as old as it was you couldn’t do too much with just textures. 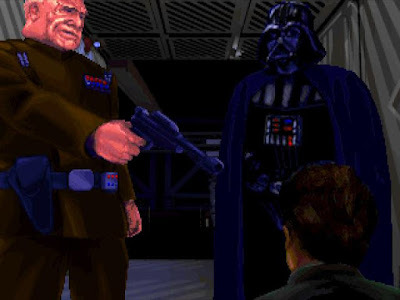 The game’s retro sounding star wars score soundtrack really stood out to me and it was great when you recognised a tune and really added to the atmosphere and the situational music helped too, the sound effects were equally great, all in stereo as well. Although my experience with Dark forces wasn’t fully functional I suppose you say, I enjoyed it anyway and much more so with the Dark XL mod and when the mod is fully finished I dare say I’ll play it again. It was great to see the beginning of the Jedi Knight series one of which I am going to continue playing to see out the series. As I’ve said before Star Wars Dark Forces is not just a Doom clone, it has a whole new engine and many elements that make it different if not better and I will maintain that stance throughout the years to come. It’s said that almost every gamer has played an ID Software shooter in some form but this is a game every Star Wars fan of all types should play. Overall storyline and missions designed very well. Control system obviously dated and not able to be configured enough.